Mouth Full Of Blood : Essays Speeches And Meditations - ubiq bookshop: the best place to buy books! Spanning four decades, these essays, speeches and meditations interrogate the world around us. They are concerned with race, gender and globalisation. The sweep of American history and the current state of politics. The duty of the press and the role of the artist. 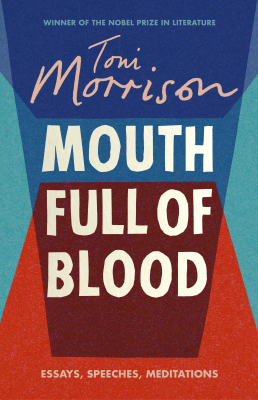 Throughout Mouth Full of Blood our search for truth, moral integrity and expertise is met by Toni Morrison with controlled anger, elegance and literary excellence. The collection is structured in three parts and these are heart-stoppingly introduced by a prayer for the dead of 9/11, a meditation on Martin Luther King and a eulogy for James Baldwin. Morrison's Nobel lecture, on the power of language, is accompanied by lectures to Amnesty International and the Newspaper Association of America. She speaks to graduating students and visitors to both the Louvre and America's Black Holocaust Museum. She revisits The Bluest Eye, Sula and Beloved; reassessing the novels that have become touchstones for generations of readers.